Alfred was born in Northenden Cheshire in 1883, the son of Thomas Benford and Elizabeth nee Chadwick. His father was the station master at Northenden, he was living at the station with his family in 1881, wife, three daughters and his mother in law Mary Chadwick. Sadly both Alfred’s parents died in 1890, so the children returned to Claybrook Leicestershire, their father’s birthplace, where they were taken in and brought up by their father’s sister Clara Perkins and her husband John, a blacksmith. In 1901 Alfred was 17, boarding with Walter Perkins, a railway blacksmith, and his wife Sarah (b Claybrook) at 161 Abbey Street, Rugby (RG13/2917/16 p23). Walter was John Perkins’s brother. By 1911 he was 26, a clerk to a corn merchant, Mr William Pridmore, boarding at 15 James Street with George Harrison, a church caretaker. His obituary in the Rugby Advertiser of 17 July 1915 says he had worked as head clerk and traveller for Mr Pridmore for six or seven years. He was well known as a cricketer, playing for the Rugby Club Second XI, and the previous year had been elected captain of the Rugby Early Closers Athletics Club of which he was a prominent member. He joined the army on 3 September 1914 and embarked for France on 18 May 1915. He had only been at the front for a week before he was shot through the heart by a shrapnel bullet during a heavy bombardment. Lt Forster of the KRR wrote to Alfred’s sister “I cannot say how sorry I am to lose such a good man, and one who was so reliable in every way”. Alfred is buried at Ypres Town Centre Cemetery Extension. He was awarded the Victory, British and 15 Star medals. 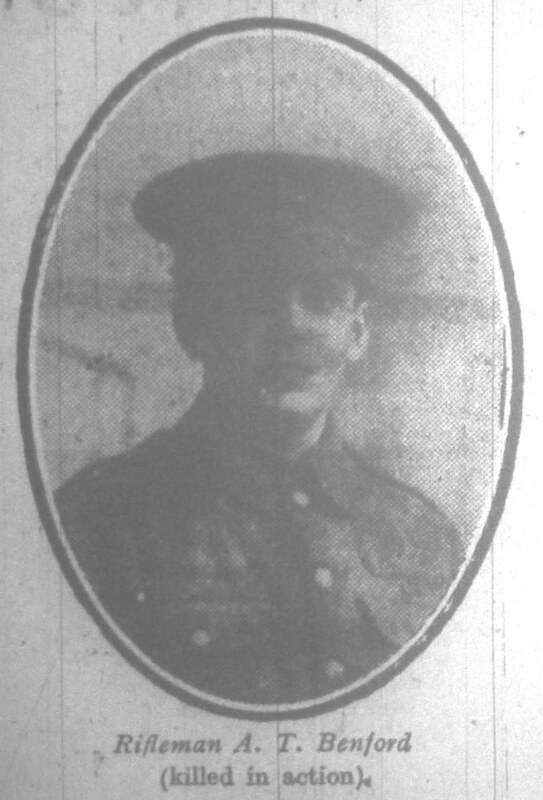 This entry was posted in Biography and tagged 1915, Benford, Kings Royal Rifles, Northenden by Christine. Bookmark the permalink.